Oh, and BTW, the theme for this week’s Fun Foto will be MIGRATION. So start rooting around for those 0-12 year-old-friendly photos that shout migration to you! Oh, but first, remember that surprise I promised? Actually, the surprise is likely a lot more fun for me than it is for you, but I have to share it anyway! You know my story Not Yet, Rose? It’s about a little girl who is waiting for a new sibling and isn’t sure how she feels about it. 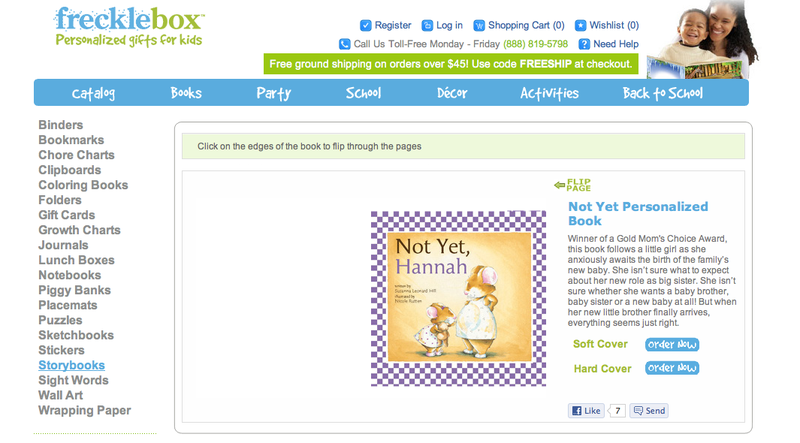 Well, ROSE has been picked up by Frecklebox.com, a website that creates all kinds of awesome personalized gifts for kids. The result? As of right this very minute you can order Not Yet, Rose in either hardcover or paperback, for the girl of your choice, as in Not Yet, Olivia, Not Yet, Alexandra, or Not Yet, Brunhilda! How fun is that? But should you ever have a little girl in your life who is about to become (or has just become) a big sister, now you can make a very special gift just for her. Plus, I know the author, so I know how you can also get your book personally signed 🙂 The book is exactly the same as the original, with all of Nicole’s beautiful artwork. They just change the name for your special girl. And there’s a place for you to add your own printed dedication, too. So, apologies if you were expecting a better surprise than that, but it seems very fun to me! Now. Onto today’s Would You Read It! And don’t forget to join us Friday for Fun Foto (Migration) and Straight From The Editor! That said, the one thing I feel is missing is the personal stakes. Does Art have a project in the running? Is he worried about losing or getting beat up? Knowing exactly what he's fighting against would make this a lot more intriging for me. So I guess right now, my answer is Maybe. Yay Susanna! That's great about Frecklebox. We have one personalized book for our oldest daughter, since her name isn't a common one, so I love this option! And the pitch presents an interesting idea, but I think it could be more concise with a bit more tension in it. Is the math whiz jealous of the bully? That would be an interesting angle to make it different. I think the part about not being good at writing and reading could be left out as when we read math whiz we kind of assume that. I think this would be a very interesting book, but maybe the pitch has to be jazzed up a bit? Awesome news, Susanna! I'll definitely have to check it out. I think I'm a maybe for this one. I like the concept, but it sounds a little didactic, or perhaps like Art is a tattle tale (kids hate that). I think it would be more compelling if math-whiz Art was not so great at science. Then he finds himself part of a science fair project that could win! Until he discovers the leader of the project (school bully) is breaking the rules… then Art would face the inner struggle of wanting to, for once, be considered good at science, but also wanting to remain honest. I think I would read it, but maybe more so if the blurb mentioned he is perhaps few on friends or subject to the bullying which would amp up the stakes for being the tattler. I think the opening of the pitch is a little wordy, but I love the premise and it gives a very clear idea what to expect from the book. Definitely sounds like a good one for the agegroup too. Congrats on the book. And, it's wonderful news any day of the week. I say maybe on the pitch. Anytime a bully is involved it invokes tension for me. But, I'm not sure why Art needs to expose him. Is it for his own project, for the school's integrity, for the sake of taking down the bully? Gleek makes me think of the TV show Glee. I think that's what fans are called. That might impact your audience. As Glee fans might think it's about a Glee club. Good luck Christie and thanks for sharing this work. I love the bravery of everyone for sharing pitches. First… that is so exciting about your book. I think that is the coolest idea ever! Congrats, Susanna, on your book release. I love the rewrite Janet Johnson did to the original pitch. Everything is there (minus the reading and math bit, which I agree wasn't needed), but the added punctuation and rewording made it less convoluted. I'm not sure I'd read it though. The premises sounds interesting. However, it's missing that umph which would tip me over. It's lacking a personal connection. Why should I care about the main character? What's at stake if the bully should win the project fair? YES. But I agree with Janet's suggestions about how to make the pitch tighter and more compelling. And your news about ROSE is so exciting! I'd love to get a copy (not sure who for yet, but I'll figure that out!). Do you know if they ship to Australia?? Stina, Reena and Cally – thanks for you comments for Christie! Stina and Cally – thanks for the congrats. And Cally, I don't know if they ship to Australia – I will ask! Congratulations, Susanna, on NOT YET, ROSE?! I can't wait to hear more about your success with this book. And, yes, I would love to read the book that is being pitched as well. What if the first part were rewritten very slightly such as this? When eleven-year-old math whiz Art Schaeffer unknowingly stumbles upon the school bully's rule-breaking science fair project, he must find a way to expose the bully before the judges make their final decisions. YES, I'd read this MG book! Sounds great for this age group. I agree with others that, “but not great at reading and writing” might not be necessary (since we can't see how that relates to the plot). And great news, Susanna! I've got a newly-pregnant sister, and this would be perfect for my niece, a big-sister-to-be! Great news about the Frecklebox deal. I think I'm a maybe with this week's pitch. I go for anything that gets the better of bullies. I find it very hard to work through my own story plots when a bully looms large. It's always so satisfying to see them disarmed. However, the first line misses a trick. Telling us about Art's educational strengths and weaknesses may be relevant to the plot but it slows down the pitch. Congratulations on the individualized books deal – supper idea. Mine is a maybe for reading.. The premise sounds interesting, however, I don't immediately feel drawn to Art and his dilemma. I did wonder if it might work making Art a year or two younger and aiming for a younger audience? The premise is interesting and makes you want to read it. But as someone said earlier, the first sentence is a mouthful. I don't think you need to say that he isn't good at reading and writing. Just stick with the fact that he's a math whiz unless for some reason, the reading and writing plays a part in the story. Since Christie is one of my critique partners and I know her writing is great, I'd say yes. But, on the basis of the pitch alone it would be a maybe. Art is a math whiz, but he's taking on the school bully about a science fair project? I didn't get the connection, or where reading and writing fit in. Also, as previous folks have said, I want to understand more of the stakes for Art – I'm sure they're high, but we need to get a better feel for them. Fifth grader, Art Schaeffer, nicknamed Gleek because he can “snake-spit” further than anyone in the school, loves to eat, but nobody can tell by looking at him because he's as picky and as skinny as his pet snakes. Although Gleek is the treasurer of the Math and Science Club, he cringes at the prospect of having to enter the upcoming Science Fair because he doesn't like reading very much and absolutely hates writing (and spelling), all of which would be required to create a winning entry. Enter Cody Boggs, nicknamed Matso because he's the smartest math whiz in the school, loves to eat and everybody can tell by looking at him because he'll eat anything. When Matso enters the fair with a strange food experiment, Gleek becomes suspicious and discovers Matso breaking lots of rules. Gleek wants to report Matso anonymously, but doesn't know how to submit an article to the school paper, much less how to write one. The closer Gleek gets to finding out Matso's secrets causes him to fear for his safety. Will Gleek find out a way to expose Matso before the judges of the Science Fair award the prizes? And will he do so with his limbs still intact? Think of it as a jacket flap blurb. Would that persuade anyone's maybe to a yes? Maybe we can all put our thinking caps on and use all the information in Christie's longer blurb to help her come up with a shorter pitch that does the job…?